When someone starts talking about memorization of math facts, people tend to have strong opinions. We all had a variety of experiences as children ourselves, and those experiences coupled with notions of best practices in education can cause for heated debates. In today’s post we would like to share the results of recent research on the topic. At first glance, the results may seem at odds with Montessori theory, but upon further examination this couldn’t be further from the truth. Read on to find out why our materials and methods can provide children with exactly what this “new” information suggests they need. This summer Paul L. Morgan, Ph.D. published an interesting article for Psychology Today. Morgan works at Penn State as a professor in the education department as well as Director of the Center for Educational Disparities Research. He and several colleagues (George Farkas and Steve Maczuga) conducted research to investigate instructional practices and their effects on student achievement. Their specific focus was on first grade classrooms in math. What Do Montessori Teachers Do? According to the researchers’ definition of teacher-directed learning, this is exactly the approach that is taken in regards to students learning their basic math facts in Montessori classrooms. Our initial reaction is simply a result of semantics and misconceptions. Do Montessori teachers utilize worksheets and drills? Well, not exactly, but we still meet the definition in other ways. One of the most common misconceptions about Montessori education is that the children are let to do whatever they want all the time. Some people think that choice is the driving force (it is, at least in part) and the students run amok. Anyone who has spent any time learning about Montessori or observing in a classroom knows the opposite to be true. Montessori is really all about choice within limits. Teachers create an environment rich with materials that call to the children, and while they do have lots of decision-making opportunities, they are only provided with options that will lead them to meet desired outcomes. The same is true for math fact instruction and practice. Let’s get down to the facts: in Montessori classrooms, the teachers provide direct fact memorization instruction. At the lower elementary level in particular, one will find shelves stocked with materials that were designed to aid the process of math fact memorization. Typically a teacher will give a child a lesson on a material to explain how it is to be used, and then detail their expectations to the child. Children are generally going to be practicing and recording their facts on a daily basis. Montessorians believe that while understanding the concept of why we manipulate numbers and having a visual representation helps children in the long run, we agree that when it comes down to it those basic facts really need to be memorized with an emphasis on speed and accuracy. This is one of the reasons our children are able to solve larger complex operations problems at a younger age than children in many traditional settings. Taking a closer look at specific materials, how they are used, and their intended outcomes may help to refine these points. 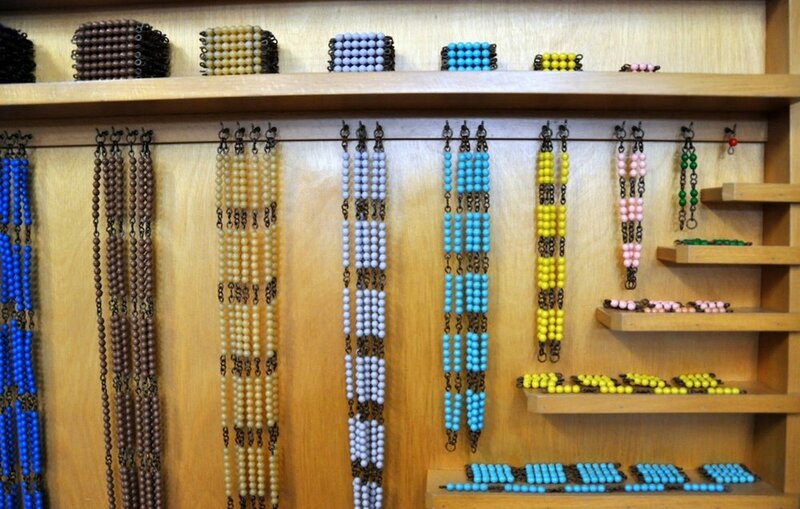 The bead chains/bead cabinet: Children begin using this material as early as 3 years old. While the initial purpose is for children to learn to count, during the elementary years that skip counting translates into speedy memorization of multiplication tables. The transition tends to be fairly smooth, as they’ve already been practicing for years! Bonus: the same material will help them understand squares and cubes just a little further down the road in their school career. 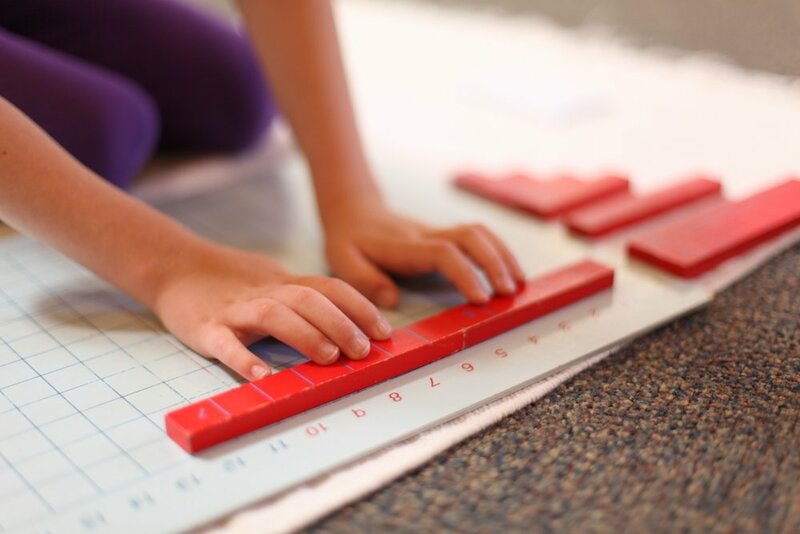 Addition and subtraction strip boards: While a student initially uses these materials to explore the concept of adding and subtracting, they quickly notice patterns and build speed as they gain confidence. These materials are typically introduced at age 5 or 6. Multiplication and division bead boards: Like the strip boards, these are initially used by students to gain a basic understanding of the concept. As they master individual facts, they naturally start to create shortcuts for themselves and a trained Montessori teacher will observe that they are ready to move on to more challenging materials. Finger boards: Created for each of the four operations, these materials are essentially wooden versions of the classic fact charts. Children are slow to fill them in the beginning, but after repeated practice they build speed and accuracy. Control charts are readily available for immediate feedback, ensuring that even when a child is practicing independently they will be able to know whether they are answering correctly or not. Blackline masters: Montessori teachers have blackline masters, which are essentially paper copies of the finger boards, that are available for children. Children are expected to complete the material and then record the information on the paper version, thus providing another layer of repetition. If there is one area that many math teachers (Montessori and otherwise) could stand to improve upon when it comes to math facts, it would be taking the time to target math fact instruction. Making sure our students are practicing daily, quickly, and accurately is critical, but might we also help them practice smarter? Sitting down with each individual child to gather a quick assessment periodically can make a huge difference in progress. While gathering data in this fashion is time-consuming, we may find it well worth the effort. Teachers can sit with a child and quickly run through a chart of facts, asking the child for answers orally. Highlight the facts the child can answer quickly and confidently, leaving the others blank. Teachers make a copy of this sheet so that the student can keep it to reference. When it’s time to practice math facts, children can focus on the ones they haven’t yet memorized, rather than eating up time going over the facts they’ve already mastered. Perhaps it happens one day when your four-year-old comes home from school one day, excited to show you their work for the day. They proudly show you a perfectly traced pentagon with elaborate, colorful patterns inside that they have created. Maybe it’s when your eight-year-old casually references acute-angled scalene triangles. Regardless of when it happens, as Montessori parents, there comes a moment when we become acutely aware (pun intended) of our children’s interesting knowledge of geometry. We may recall our own study of the subject beginning much later - likely sometime during our high school years and typically not as exciting as our own children depict! We notice that our children seem to be really ready for the information, which can feel surprising. Not only are they ready, but the work seems to fill them with joy and satisfaction. As with so many things, Montessori discovered that young children are fully capable, and in fact developmentally primed, to learn about subjects that have traditionally been reserved for much older children. Geometry is a perfect example. Read on to discover what this portion of a Montessori education can offer your child. From ages 3-6 much of children’s geometry instruction in Montessori classrooms is indirect. That is to say that while they are practicing crucial developmental skills, they are often doing so through the lens of geometry preparation. One obvious example, as mentioned above, is with the metal insets. Children trace a variety of geometric figures including squares, triangles, circles, curvilinear triangles, and quatrefoils, among others. The main objective of this work is to prepare the child’s muscles for proper pencil grasp and handwriting. When they have mastered tracing they work to create intricate designs within the figure. Primary children are also given a number of simple geometry lessons that allow them to begin naming figures and exploring shapes. Wooden geometric solids are held and named by the children (cube, sphere, square-based pyramid, etc.). The geometry cabinet is composed of drawers of related figures; small wooden insets are organized into a polygon drawer, curvilinear figure drawer, triangle drawer, and so on. Children also use constructive triangle boxes to manipulate triangles in order to form larger triangles and other geometric figures. The key during these early years is to give children early exposure to geometry and allow them to use their hands to explore these concepts. Throughout the second plane of development (ages 6-12) the study of geometry continues to spiral and go into more and more depth. Children as young as seven learn about types of angles and how to measure them. Eight-year-olds explore regular and irregular polygons, as well as congruency, similarity, and equivalency. In lower elementary children begin learning about perimeter, area, and volume. In upper elementary, children begin to learn about the connections between the visual aspects of geometry and numerical expressions. They apply what they’ve learned about perimeter, area, and volume to measuring real-life objects - including Montessori materials they’ve seen in their classrooms since they were three years old. They learn about things like Fibonacci numbers and Pythagoras which appeal to their sense of number order and geometric patterns. Now, when your child comes home with surprising knowledge about geometry content, we hope you have a better idea of where they’re coming from. If you have any questions or would like to see this type of work in action, please give us a call. When a child is ready to learn about basic operations, there are plenty of materials to support them. Montessori math uses the golden bead material; first to build numbers into the thousands. For example a single golden bead represents 1, a group of 10 beads are strung together in a straight line for 10, and 100 beads are affixed into a flat square. The thousand cube is as large as 1,000 of the original single ‘1’ bead. Once a child is able to build a visual representation of a number, the beads are used to teach basic operations. Young children are able to add, subtract, multiply, and divide numbers into the thousands using this material. They first learn with static problems - that is, with no exchanges - and then move on to more complex, dynamic problems. They quickly learn that ten 1s is equal to one 10, and they do this by holding those numbers in their hands. The best way to really understand Montessori math is to see the materials in action. Schedule a visit to watch children using them in the classroom, or join us for our upcoming parent education session on Monday, March 26, 2018, 6:00-7:30. Contact us for more details!